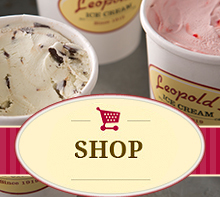 Leopold's Ice Cream / Scrapbook / From our team / Scoop The Vote! the purchase of a banana split with proof of voting*. Abercorn and Lincoln Streets) in Savannah, Georgia. Day by offering a sweet incentive – a half price banana split! *Includes the peach sticker given when voting at the polls, showing the completedcard available at the polls upon request, or the official absentee ballot envelope.